Also known as the seat belt injury or Chance fracture. 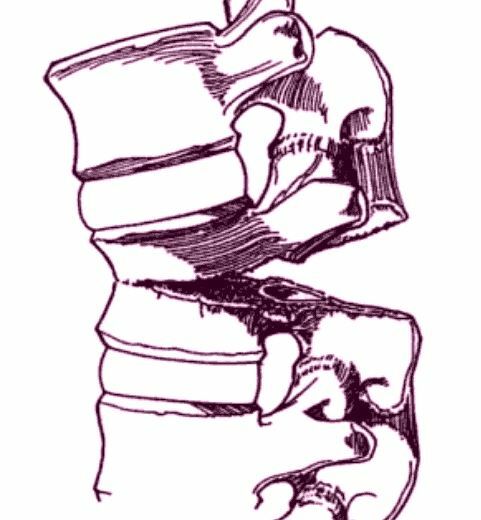 The seat belt fracture is a transverse fracture through a vertebral body and neural arch (see figures). The mechanism of injury is flexion and distraction. Although it was originally described as a pure osseous lesion, the fracture may also occur through the disc and the ligaments. It is usually associated with motor vehicle accidents in which the injured passenger is wearing a seatbelt, frequently just a lap seatbelt. It was described by British radiologist George Chance. Seat belt fracture generally occurs at the thoracolumbar junction. Although it involves all three columns of the spine, it can be treated with orthoses when it was a pure osseous lesion. In case of external stabilization is not feasible (due to severe obesity, concomitant systemic trauma, etc) it requires spinal stabilization to restore the posterior tension band.